You are here: Home / Money / How to Make Extra Money Online? How to Make Extra Money Online? When I was doing job I had extra income from sites. When I am into managing sites I make extra money from clients. Let me share how I always make extra money online. When I visit any family function I have hard time explaining what I do for my living. Many a times I take a short cut of not explaining about “online blogging” but just tell them that I work for online clients because it is something really easy to explain. Freelancing is not major part of my income but forms considerable part of my income online (See here). I am always looking for more than one income source. When I was doing a 9-5 job I had extra income from my sites and stock market. When I am into managing my forums and blogging I look for extra income from clients. Before I explain how I go about making that extra income online let me clarify that I am not talking about making extra money doing nothing but I am talking about doing few extra things that can help you make extra money online. 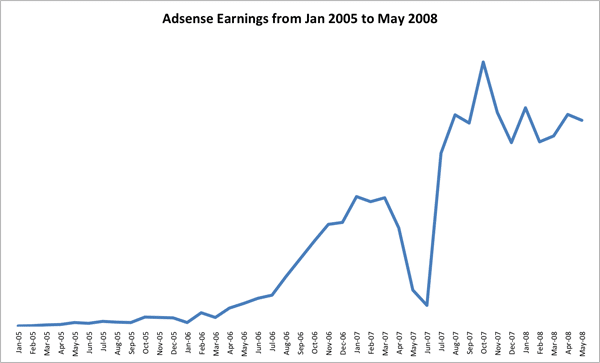 Visualize my Adsense earnings when I was doing a full-time job. The numbers are not important but the important part is the growth in income. I used to work on my sites after returning home from my day’s job and on weekends. When I am into managing my forums and blogs, I have an extra income from my clients. Apart from freelancing I also do a lot of equity investments and they also form a lot of extra income for me but we would try to avoid that part of the equation because we want to be focusing on Making extra money online and not focus on making extra income. So I will explain how I did it and how you can also start making an extra income online and scale up that income to make it your full-time income like I have done. Setting up a blog is very easy and there are plenty of resources to help you get started. I also offer Free Blog Setup service to help you get started. Once you have your blog online you can add couple of articles per week to your blog for next six months. I am sure you can get this done along with your day’s job or college. I was able to get this done for my forums and blogs because it only means writing one article each on Saturday and Sunday. Assuming you do this for the next 6 months, you have 50+ good articles for your blog. Remember you should only focus on writing two good articles on your blog each week and not worry about too much about any other aspect of blogging like links, social media promotion, search engine optimization etc, etc. If possible don’t even install stats software like Google Analytics or WordPress stats on your blog for checking how many people visited your blog and other things because it really does not help when you are getting started and makes you a stat addict. We are focusing on building a blog to make extra income online. Once you have your 50+ good articles on your blog, you can apply for Adsense. Adsense needs blogs to be online for 6 months and as you have added really good content over the past six months it should help you to get approved in Adsense fairly easily. Now you can add Adsense to your blog. Before you add Adsense to your blog I will recommend you read Why Most New Blogs Fail? Don’t worry too much about how many more cents you have earned from your blog in Adsense because the idea is not to make a living out of Adsense from your blog. Having single Adsense Ad unit somewhere in the sidebar should be able to help you understand the working of Adsense and make extra income online just for working few hours on weekends. Instead of focusing on building Adsense income focus on building your blog. Read as much as you can about blogging and you can even ask your friends and colleagues to contribute some articles to your blog. Slowly but surely you can build into the extra income online with your blog and as your blog starts picking up you can decide on what you want to be doing more. Blogging or Job. Is Blogging right for you? Many would argue that I am not a writer and cannot write articles like you do. Let me share with you something. Being an Indian, English is not my first language and I am still horrible in English Grammar. In my wildest of dreams I could not imagine about becoming an author of an eBook. Till date I am still not confident where to use their and there or week or weak. I use Microsoft Word’s English Grammar tool and other software’s to make better English of my article and so if I can write and get going into online blogging, I am sure anybody willing to try CAN. If you know your weaknesses, you can work on them and improve on it. You have almost 15 to 16 years of education to get a job. If you are passionate of becoming an entrepreneur, can’t you just give blogging a try for few months learning better English and see what happens? There are many services that allow you to start a blog for free like WordPress.com or Blogger.com and you can use them to get the feel of blogging. Once decided that you want to stick with blogging you may need to make your self hosted blog because you cannot make money from your free blogs that effectively. See why here. Anyone trying to make money with a blog or a website will probably be more successful with a self-hosted blog. Getting a self-hosted blog is not free, but not very expensive either. Costs $5 per month for having your blog online. Check out website setup guide. How to Make Extra Money with Blogs? You can apply any or all of the above if you are not having it on your blog but what more you can add is have a freelancing or consulting profile on your blog where potential clients can hire you to get the task done from you or can hire you for consultation. Lot of things depends on the niche of your blog. As an example if you have a blog about cooking you may not be hired for cooking the recipes but you can be hired to write recipes on other sites or may even be hired by other related forums to become a moderator. Consulting really works well on both of my blogs (Other one is Technical Analysis Blog) where I provide one on one consultation that forms considerable amount of extra money I make from my blogs. I am not advertising myself on my technical analysis blog but I do that a lot here and you can see that in my post about vBulletin Optimization where the closing of the article has an option to hire me for further vBulletin optimization. I had numerous clients contact me for custom vBulletin optimization suggestions. I am a fashion designer and an health expert…I am a movie buff also…I need to create a blog which deals with health, cine news, cine photos, dating, Living and relationship, life style….Will I get google ads? The sites you have in the links are almost adult looking site. They may not be adult sites per se but from the news that I see on home page I am not comfortable opening them in my office and so you will not get Adsense for those kind of sites. As you can see that those sites also don’t have Adsense ads. Great article. I have been working on mine as well in the same manner. Just takes time to build. Hope people take what you have said and work at it slow. There is no fast way that I have found over the years. I completely agree with you Mathew. Rome wasn’t built in a day and no matter how advance technology we use, it cannot be build in a day. All your articles are interesting shabbir. Seriously man, you have good writing skill. I was thinking about leaving blogging since I’m not sure whether if it is possible to earn. Ofcourse there is little money coming from it. This is my blog- http://www.VerifiedHomeJobs.com. Working sincerely for 6 months is not criteria for the amount of money you can make and it also depends on lot of other things like your niche of blogging. The niche you have selected is very competitive and as you are not sure about the home jobs offer, how can you suggest them to others. I think you need to be blogging where you can write good articles. hey, I earn some money from freelancing sites, selling on eBay, etc., As I’m trying to keep online earning as my main source, am little afraid of the income potential level whereas, most of the people I teach about online income are looking only for extra income.. All those I said should work for others though i myself dint try few of those.. but yes, most of those are ones I tried myself.. So if you can write god articles on the niche I think you should be fine but to be very honest I visited your blog and hardly could spend few seconds before hitting the back button. You need to showcase your best articles and also have option to grab visitor into a reader. Thanks for that advice, Shabbir. I accept it completely, its because since I don’t know about how much exactly we can make from blogs, I wrote those blogs half heartedly plus lang probs. If I find any sign of improvement, even a little hope, I’ll think if I should approach it professionally by paying for web masters and writers. Lets see! The problem is not language or anything but also the professional looks of the site and other things. Actually I cannot read anything in few seconds and before I read I can assume this is not the site by a professional. Yes you would need a pro design and then possible good content. It looks 100% spammy and still ranks at very top of google serp and has a PR3 by google. Though the site looks small with very less content, still they achieve top keywords. What would be their technique and your opion on that site? Completely spammy site as you said but they may have grabbed good links and so may be they are ranking well assuming they are ranking well. Now you have to understand that ranking does not mean earnings because they may be ranking for terms which does not drive sales and I am sure they are not earning much because they have too many ads to substitute their own registration process. Example: My ebook site http://shabbirbook.com/. I have no ads on that site for simple reason that I want people who land on that site to buy my book and not have ads because ads will not pay me what a sale will. Now consider their site which has more ads than their own register button clearly suggesting they are not doing good with the registration and so now have added the ads which are also not from Adsense and I can sense that Google did not approve the site. Nice analysis, Shabbir. But what I heard is they are earning some good amount only from those advertisers. I believe so because there are a lot of people who are looking to earn online. Hey, thats a nice marketing idea to supply first 3 chapters for free of cost. Good move! Not sure how you know that they are earning good amount from site because those ads are direct do follow links and not ads and so they have actually sold ads on their website to their competitors site which is not sign of good business which is making money. About my book yes sample chapters idea is working really well for me. Hi Shabbir bhai. Terrific article on how to make money online. Your writing is really motivating & it was real pleasure reading it. Keep up the good work. The pleasure is all mine Raj.